An artist's illustration of a flare from Proxima Centauri, modeled after the loops of glowing, hot gas seen in the largest solar flares. The planet Proxima b, seen here in an artist's impression, orbits Proxima Centauri 20 times closer than Earth orbits the sun. A flare 10 times larger than a major solar flare would blast Proxima b with 4,000 times more radiation than Earth gets from solar flares. 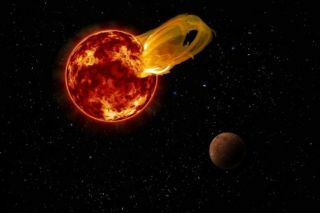 The rocky planet circling the closest star to the sun got hammered by a superpowerful flare last year, a new study reports. That's a bit of bad news for anyone hoping that the alien world, known as Proxima b, hosts life. "Over the billions of years since Proxima b formed, flares like this one could have evaporated any atmosphere or ocean and sterilized the surface, suggesting that habitability may involve more than just being the right distance from the host star to have liquid water," she added. Proxima b has inspired a great deal of excitement among astronomers and astrobiologist since its discovery was announced in August 2016. The planet is only slightly more massive than Earth, suggesting that it's a rocky world. And Proxima b appears to orbit in its host star's habitable zone — the range of liquid-water-supporting distances referenced by MacGregor. Such proximity raises questions about the potential habitability of Proxima b and similar worlds. Red-dwarf planets close enough to be in the habitable zone are likely tidally locked, meaning they always show the same face to their parent stars, astronomers say. So, one side of Proxima b may be broiling-hot, while the other is cold and dark. It's possible that thick atmospheres distribute heat around tidally locked planets, making at least some parts of these worlds habitable, some astronomers have said. But Proxima b and its kin face another habitability challenge — stellar eruptions. Red dwarfs are very active stars, firing off lots of powerful flares, especially when they're young. So, astronomers already knew that Proxima b had absorbed a lot of punishment over the eons — but the new study suggests that the damage may be greater than scientists had thought. MacGregor and her colleagues reanalyzed observations of Proxima Centauri made early last year by the Atacama Large Millimeter/submillimeter Array (ALMA), a network of radio telescopes in Chile. The researchers discovered that ALMA detected an intense flare on March 24, a monster that was 10 times brighter than anything the sun blasts out. The flare boosted Proxima Centauri's brightness by a factor of 1,000 over a 10-second span, the researchers said. "March 24, 2017, was no ordinary day for Proxima Cen," MacGregor said. The team's analysis also throws cold water on the hypothesis that the Proxima Centauri system hosts rings of dust and rock similar to the asteroid and Kuiper belts in our own solar system. That interpretation — an intriguing one that hints at the possible presence of undiscovered planets neighboring Proxima b — had been based largely on these same ALMA observations. Those findings seemed to suggest that something in the system was re-radiating stellar light at long wavelengths. But that original analysis didn't take the superflare into account, study team members said. The March 24 outburst was likely responsible for the brightness "excess" observed in Proxima Centauri, eliminating the need to invoke dust belts, the researchers said. "There is now no reason to think that there is a substantial amount of dust around Proxima Cen," co-author Alycia Weinberger, also of the Carnegie Institution, said in the same statement. "Nor is there any information yet that indicates the star has a rich planetary system like ours."